"A Family Tradition Woven In Excellence"
My Cousin Vinnie, AQHA registered name “Bea Bea Bunny” came to Runnymede in 1994 after four grueling years at the racetrack. He had raced 47 times and received his “Register Of Merit” with a Speed Index of 91, which was considered average. He had won a few of his starts, but too few to merit keeping, so the owner decided to send him to auction. He had retired sound, was a fairly big horse (for a Quarter Horse) at 16.1 hands and a nice mover, so the trainer, a friend of ours, thought I might just like this personable fellow as a jumper prospect. In his experience of working with the chestnut gelding, he’d found that the big fellow always gave his all, but that just wasn’t quite enough for the track. The trainer stopped by Runnymede on his way to the sale, which could have ended Vinnie’s life, and told me he had a horse on the trailer that he wanted me to look at. “Might make a nice jumper,” I was told. I took a look at this skinny fellow who so desperately needed some TLC and to put the racetrack behind him. He was basically a strongly framed horse, chestnut with a blaze and two white stockings behind and an exceptional mover, but there was also something about the way he carried himself and the look in his large, intelligent eyes. Despite his ratty condition, he held his head proudly high and seemed to say, “I’m not just another horse, I’m a whole lot better horse than what you think!” I studied him carefully: his movements, his attitude and made one of the best decisions of my life. I took a chance on him and from there on, the rest is history. At that time, Sean was trying to figure out what he wanted to do with his life, so together we started schooling My Cousin Vinnie. We started him over fences and it was obvious he was not going to be a hunter, but he was brave and bold and thought he could jump anything in his path. 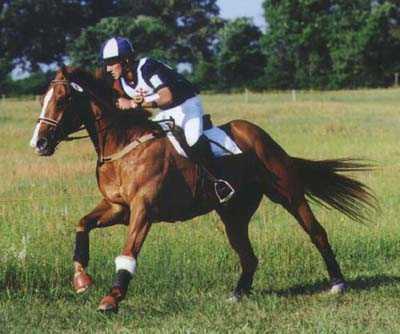 Being bold, he also loved to gallop. With ears up and eyes focused, he fairly ate up the courses we arranged for him. Along with the jumping, we’d been working him at dressage and with his way of moving, he seemed to float through his maneuvers. He obviously enjoyed showing himself off and being the center of attention. It didn’t come overnight, but after two years of training, we were ready for his debut in a Combined Training Event in Texas. Vinnie loved the crowd at the dressage ring and floated through his test and won his very first dressage phase. He was confident and strong in the cross country, so much that he and Sean had to pass another competitor, and being new at the game, Sean passed incorrectly and the pair was eliminated, but I saw enough to know we had a winning team in Sean and Vinnie! Throughout the next six years, Sean and Vinnie were to compete in Three Day Events all over the country gaining momentum in experience and laurels like a rolling snowball. Vinnie loved his job and the crowds that cheered him on. His favorite time was the ribbon ceremonies. With his head held high, ears pricked forward and eyes large and shining, he almost couldn’t contain himself, so proud was he! During those years, Vinnie almost had his own fan club, so strong was his following of the people who had come to know and love the little Quarter Horse known as My Cousin Vinnie. What a team! The two were doing things that should have been beyond their capabilities to achieve. We were so proud of this honest and brave horse who gave his all each and every time that he competed and it was paying off. The pair went on to be short listed for the USEA Event Team. Sean and Vinnie trained under eventing’s greatest stars such as Jim Graham, David and Karen O’Connor, Ann Weber, Pie Lafferty and attended everything given by Mark Phillips, Coach of the USEA Eventing Team. Sean and Vinnie went to Fox Hall which was one of the selection trials for the Sydney Olympics. 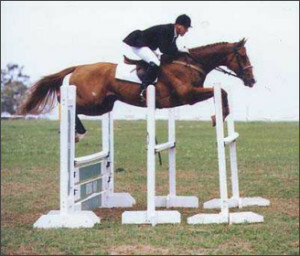 The pair was four fences from the end and up on the clock when Vinnie’s body gave out and they had a disastrous fall. After four years of racing and six years of eventing, the brave little Quarter Horse needed a break. He needed to find a new career. After a period of rest, it was decided to try Vinnie at Combined Driving. Since he’d already done it with a rider over fences, it should be easy with a carriage. He won his only Preliminary Division, but the strenuous conditioning required for the program proved to be too much for his aging body and he was retired to pasture. But this was not to be the end of Vinnie! He detested pasture! He hated the heat, the cold, the flies and doing nothing. He walked the fence and screamed to be included in something. He needed a job! A baby had been born at the farm and needed a ‘sitter’ to help him through the weaning process. Vinnie had always loved foals, so now he had a job with helping Recital to grow up independently. He loved the little guy and was a perfect companion for him until Recital was big enough to start his own career. Next came Mini Vinnie—a mirror image of Vinnie. A chestnut with a blaze and two white stockings behind. Again, Vinnie was the perfect ‘sitter’, playing with Mini Vinnie and teaching him to be confident. Mini Vinnie is now under saddle and displaying much of Vinnie’s attitudes and behavior patterns. Could it be . . . ?? Without anymore babies to care for, it was thought that Vinnie could be a lesson horse. Well, Vinnie was never so insulted in his life! The very idea of him lowering himself to people bouncing around the ring all day on his back? Vinnie would have none of that and he made it quite clear by simply ignoring everyone and standing in the corner pouting or depositing his riders on their derriere and trotting off to his stall. So what could Vinnie do that would give him the self gratification he sought and not tax him too much physically? Well, he packed up and moved to the rolling green hills of Pennsylvania with the Meloy’s. Ken, a Mason, and twice Chief Aide to his Shrine’s Potentate, belongs to his Shrine’s (Zembo) Mounted Patrol who competes in parades. All the horses in ZMP are chestnuts with blazes and white feet. Perfect. He’s in the front row coming down the street with Ken carrying a flag (sometimes the American) and all the people are cheering and clapping and he is back (in his own mind) at the ribbon ceremonies as he prances proudly along. He does drill competition with ZMP and at home, goes on trail rides or relaxes in pasture with a young horse. Vinnie has twice marched in the Hambletonian kickoff parade and in 2007 helped ZMP win the Mid Atlantic Shrine Assn. Drill Competition Trophy as well as the Parade Trophy. In 2008 Ken and Vinnie competed in some small shows in Adult Walk Trot classes gathering ribbons everywhere they went. Janet fusses over him so that his every wish is fulfilled. What a life for such a special horse. After Vinnie’s retirement from eventing Sean, who claims he has never felt the same about another horse, also gave up eventing. He is now pursuing a career with reining horses. First Show of the Season!